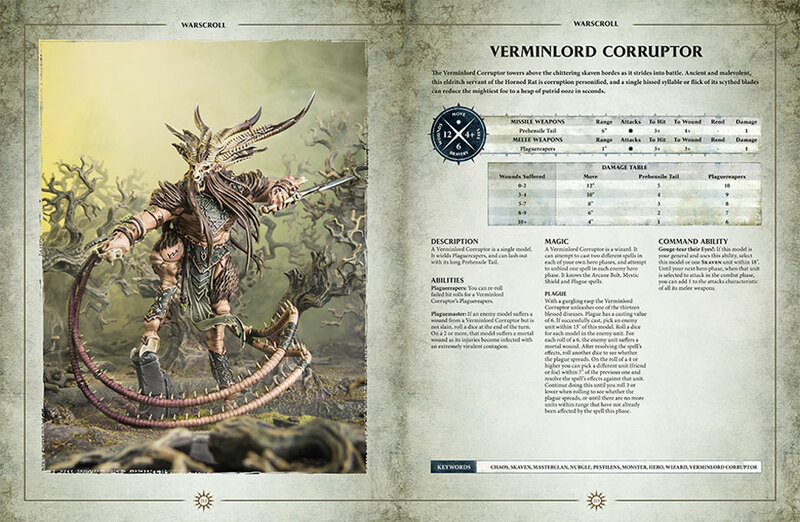 When Age of Sigmar launched back at the start of July we were promised a constantly evolving and progressing storyline, and Games Workshop is already delivering. 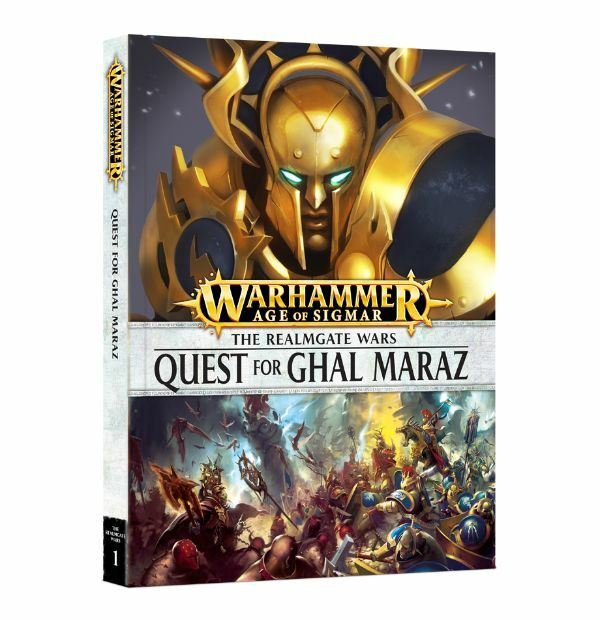 The Quest for Ghal Maraz, the second book for AoS, and the first in the Realmgate Wars storyline has arrived, so how does it fare? Lets start out with a look at the physical book itself and it's production quality. Like everything GW has been putting out lately everything is top notch. It's a very solid and nice hardcover with a suitably interesting cover. 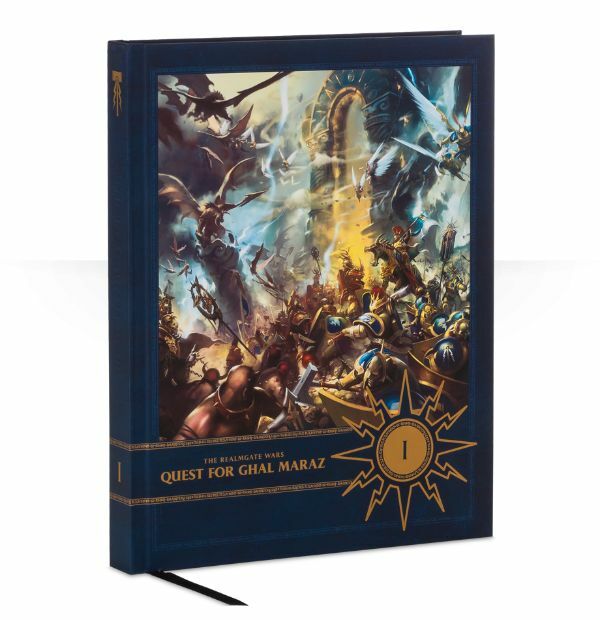 This seems to be the direction they are heading with the cover art for all of their Age of Sigmar campaign books and related materials. Both of the novels that have come out so far share a similar design with the split cover and the title in the middle. Like I said back in my reviews of the End Times books, I wasn't initially a fan of GW's newer Apple inspired design philosophy. It started with the 40k rule book and just seemed uninteresting to me. When they brought that aesthetic over to the Fantasy side of things though something really clicked. I don't know why, but I really like this cleaner, very graphic designed look on the Fantasy side of things. This also came out with a fancy special edition version and wow do I like it! It's out of my price range at the moment, but man do I wish I could have gotten that. To me it really evokes a style similar to the Forge World Horus Heresy books. I know it's not a fake leather like those, but it really looks like it. The solid blue with the gold detailing, the single uninterrupted image, and the small, understated title really give it a sense of elegance and quality. My favorite part is the Romanesque starburst with the book's series number in the center. It also comes with a pretty cool slipcover and some of the scenarios printed on individual cards. All of the artwork and photography is some of the best I have seen from them. 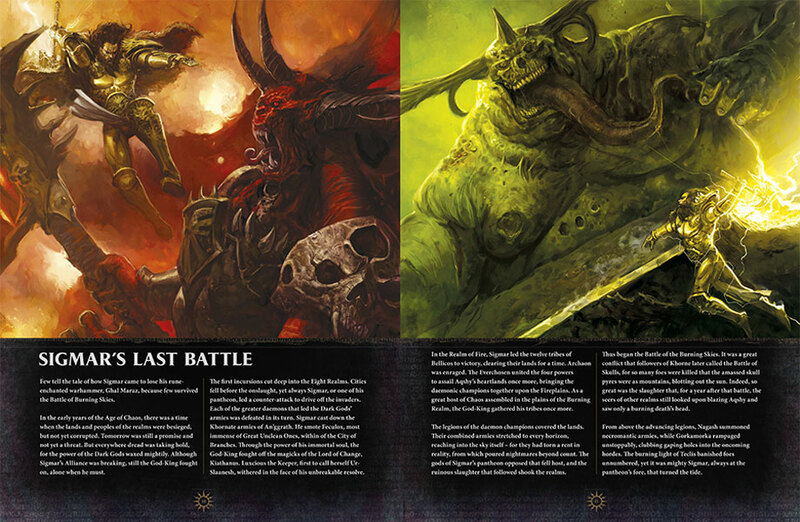 I get the sense that they are putting a lot of their top tier artists on top of the AoS stuff. I have rarely seen a bad piece of artwork from these books so far. The photography is something that has drastically improved starting around the time of the Nagash book. All of it really evokes a sense of atmosphere and narrative. It doesn't just look like a bunch of models displayed on a table. It's an interesting balance somewhere in between what GW used to do and what Forge World does. It's definitely very cinematic , but you can still tell they are in fact miniatures since they leave the bases visible. There is a lot of use of the fog machine though. It works and adds some atmosphere in, but I hope they move away from it now and then just to give us some variety in the landscapes. The story opens up by throwing us back into the past again. This time we get a brief recap of a major battle during the Age of Chaos that explains how Sigmar lost his hammer, Ghal Maraz. This makes me even more confident that in future books that focus more on the other races we will get more of the backstory from the Age of Myth and Chaos revealed. That was one of my small complaints from the first book, that the backstory on everything was left pretty vague. It looks like I was correct about their plan of fleshing it out more as the story progresses though. Once we move back to the present the story picks up right after the climatic events of the first big book. 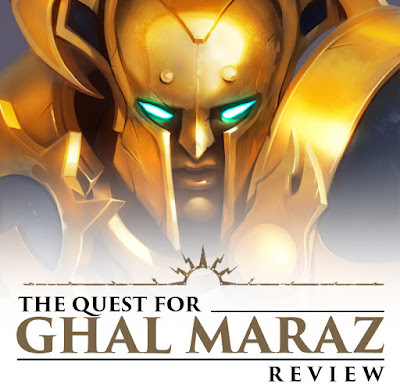 The location of Ghal Maraz has been discovered and now it is up to Vandus Hammerhand and Thostos Bladestorm to reclaim it for their lord. We follow two major campaigns throughout the story, one of which is Vandus and Thostos in the Realm of Metal attempting to find Ghal Maraz. 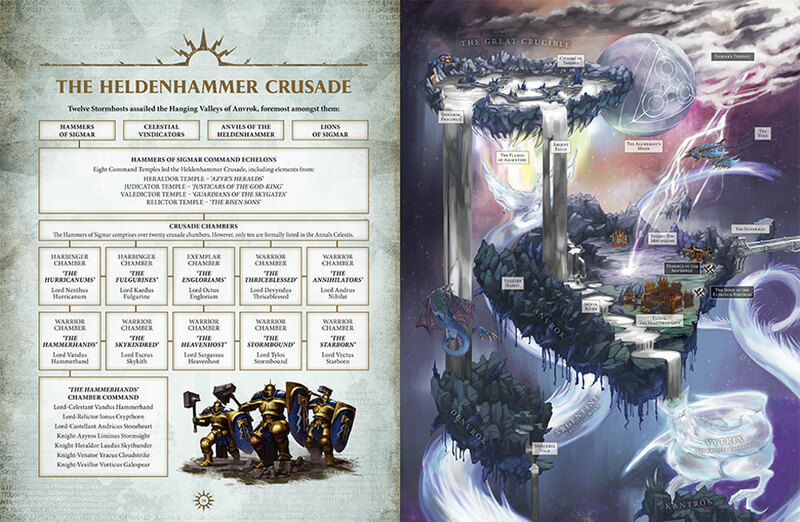 The other continues the story of the Hallowed Knights warrior chamber in the Realm of Life as they attempt to find Alleriele, as well as the fate of their Celestant, Gardus. We go back and forth between the two, which helps keep you interested and intrigued the whole time. The story was pretty good and I especially liked the story in the Realm of Life. I was honestly surprised with how the story ended there, it was not what I was expecting, so good job GW. The enemy forces consist mostly of Nurgle and Tzeentch, with a little Khorne thrown in for flavor. We also get to see the return of several villains from the Old World such as the Glottkin and Gutrot Spume. It's not really surprising that a lot of the Chaos characters survived the destruction of the Old World since it would have been easy enough for the Chaos gods to save them and transport them into the new Realms. 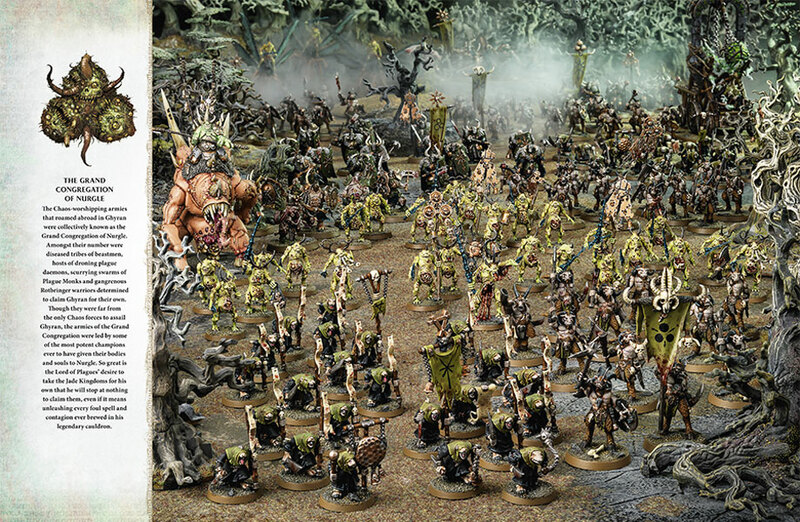 I honestly expect to see something similar with a lot of the Death characters, since I mean, they are already dead and Nagash can pretty much bring anyone back he wants. One thing that is interesting to me is that they are not afraid to kill off the Stormcast characters. They are Eternals of course though, so they don't really die. They just go back to Azyr and are reforged. If Thostos is any indicator though that doesn't mean you will come back the same. The reforging can definitely affect some more than others, and if you go through it to often who know what may happen. This seems to particularly worry Vandus when he notices the detached and strange behavior of his friend. 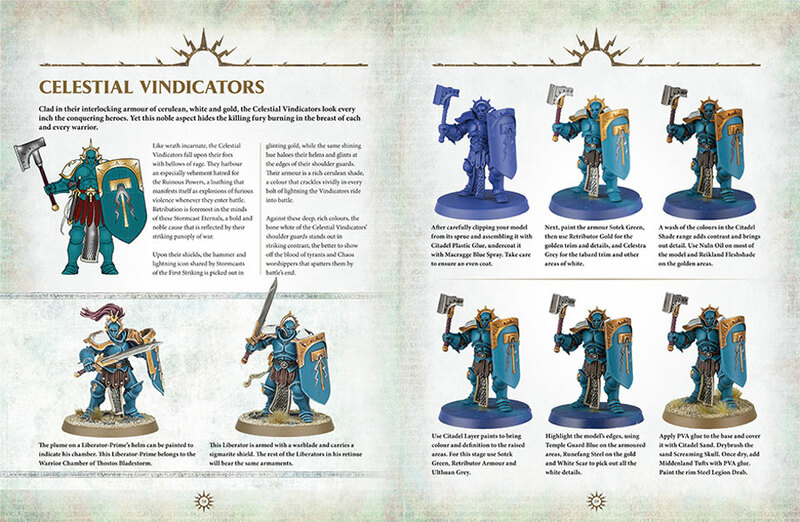 I really like how the Stormcast Eternals seem to know as little about themselves as we do. They are too new to really understand all of the rules that apply to them. Vandus even questions whether or not they truly are eternal. It's somewhat similar to the Space Marines during the Great Crusade. They had no clue how long a Marine lived for, because none of them had been around for long enough yet. It will be interesting to see how their lore evolves over time, especially in the long run in two or three editions from now. With AoS seeming to have an actual passage of time I imagine by the time we get to the third edition of the game the timeline will have processed several decades, if not centuries. 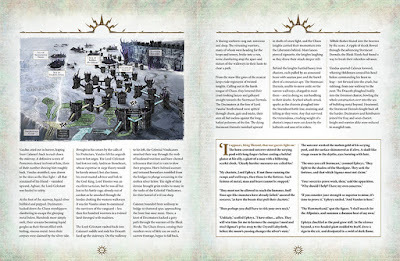 Each of the major battles in the campaign has a corresponding scenario to go along with it just like the previous book. They are meant to suit what was described in the story, but can also be used for other armies and situations. I played the Kill the Beast scenario last week against a Khorne army and it was a ton of fun. These really are the best way to play AoS. You can do a standard line up and kill each other game if you want, but the scenarios really help with the balance issues. A vast majority of them even call for uneven forces. In the game I played my opponent had about 25 more wounds then me, which included extra heroes and monsters, and I never felt like the game was weighted too heavily in favor of one of us. In fact it was pretty close the whole time thanks to the scenario objectives. I definitely look forward to playing more of the scenarios since a lot of them look like a ton of fun. The only issue I have is that there are so many scenarios and I won't have nearly enough time to play all of them with my allotment of one or two games a month. As far as problems go, that's nothing to worry about. Another cool addition that the first book didn't have are painting guides. After a chapter focusing heavily on the Hallowed Knights warrior chamber for example, we get a stage by stage painting guide for them as well as a bit more lore. 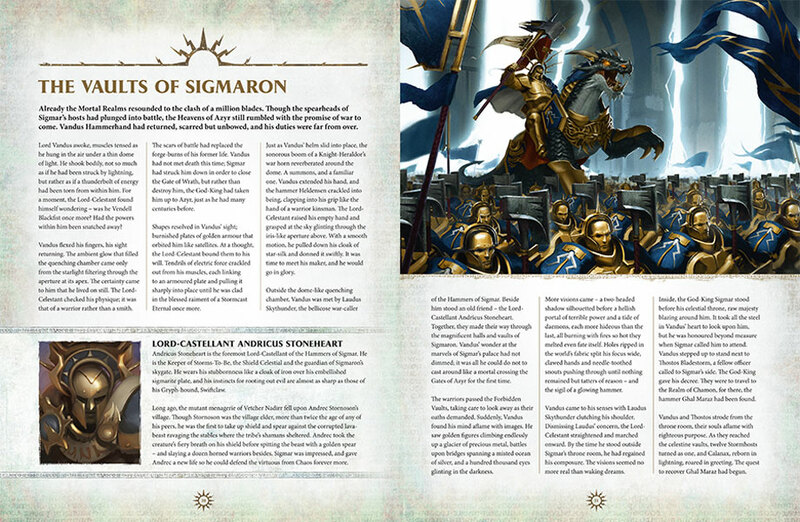 The Stormcast Eternal ones in here, which consist of the Hallowed Knights and the Celestial Vindicators, are both reprints of what was in White Dwarf, but there is a Nurgle one in there which is new. I actually really liked the Nurgle one. It was fairly simple, looked great, and is not something I would have thought of. The Eternal's ones are nice for people who didn't pick up the magazines and also good for the future. If I want to reference one of these guides down the road I probably won't remember which issue of White Dwarf they were in, but I will remember which big book they're in. 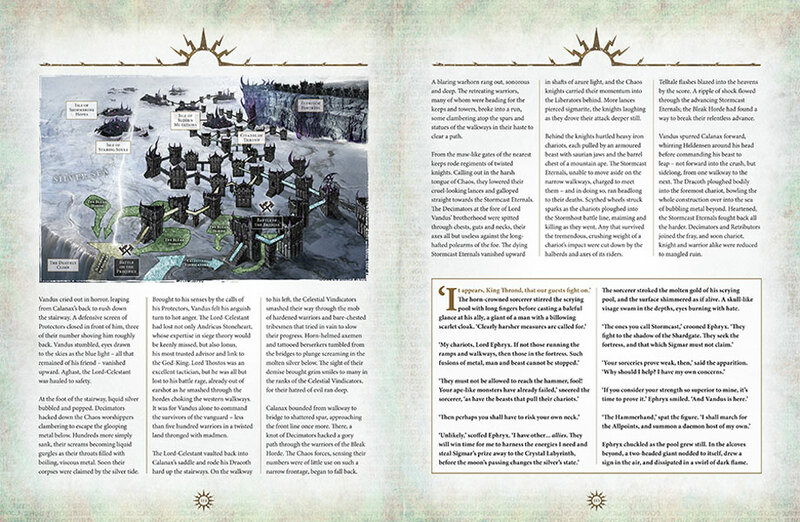 The last section of the book contains all of the Warscrolls. We definitely got more of them in this outing compared to the last one. We get all of the Stormcast Eternal Warscrolls that had been released at that point, plus two new formations for them. Chaos get's all of its Khorne warscrolls again except for the Bloodstoker and Korgorath. In their place you get the newest hero that was released as well as the Wrathmongers. The Blood Reavers and Blood Warriors also have their scrolls updated to have access to their new options. Lastly we get some Nurgle scrolls in the form of the Glottkin, Gutrot Spume, a Nurgle Lord, the Blightkings, and one of the Maggoth Lords. There are also a few Skaven Clan Pestinlins scrolls and formations for all of them. I really like how when these older units, like the Wrathmongers, get a scroll in a book the scroll in the App is updated to reflect it. The rules are all the same, but they are no longer the plain white background. They now have all of the same great art and design as their book counter parts. Some units that weren't even in the book but got a repackage also got a makeover for their scroll like Festus. Overall I really liked this book and I really like the direction they are going with the storyline. It's nice to see them payoff on the progressing storyline promise so early into AoS's lifecycle. It doesn't look like the good guys are getting an auto-win button every time either like some people were afraid of. 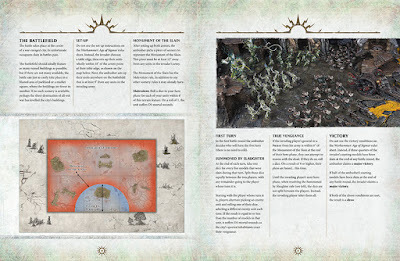 There were a few pieces of recycled art work here and there, and I would have preferred to see more Warscrolls included for the other Nurgle, Khorne, Skaven, and Tzeentch units that are highlighted in the campaign. Both of those are pretty minor complaints though. The cost of the book is the same as the last, $75, which may be too high for some people. This is completely understandable, but at this point if you are going to buy all of the campaign books coming out you have probably already made peace with that and it just requires a little planning and forethought on your financial situation. I pretty much keep a small hobby reserve ready so I can grab stuff like this if I want. They also have cheaper versions available in digital format if you can't afford the printed one, or even if you just prefer the digital version. The one real complaint I have is the lack of access in the App to the formations from this book. If you buy the digital version for your phone you can look at all of the formations in the App, but if you bought the dead tree version like me you have to pay $.99 for them a piece. I have heard rumors that they are working on something behind the scenes to try and rectify this, which would be fantastic. I understand this is all part of a learning curve for them since they have never done anything like this before. I just really hope going forward they include a key code with each book to unlock the App features as well and also allow access to the existing scrolls for people like myself who have already bought the first two books. This is less of a knock against the book though and more a problem for the App. If you like the story line in Age of Sigmar then I highly recommend you pick up The Quest for Ghal Maraz.